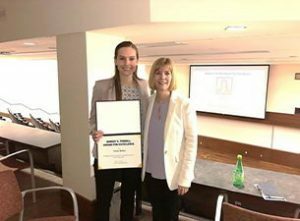 PhD candidate, Celeste Shelton, received the Robert E. Ferrell Award for Excellence from the Department of Human Genetics for her contributions to the University of Pittsburgh and to science endeavors. Ms. Shelton worked as a research scholar in the Division of Gastroenterology, Hepatology and Nutrition during her doctorate studies. Ms. Shelton is pictured here with one of her research mentors, Robin Grubs, PhD, from the Department of Human Genetics.